Vous trouverez des recommandations sous chaque section. More: Performance & Movement Concepts, Theatrical Games + more! More: Performance & Movement Concepts/ Emphasis on Body Movement & Dance/ Theatrical Games + more! More: Performance & Movement Concepts/ Emphasis on Body Movement & Dance/ Theatrical Games/ Act Building/ Practical and Technical knowledge for pros. avoir complété un stage niveau 2 de Srikanta ou équivalent. Or if you believe your not ready yet, please join us for our Level 1 & 2 Staff Retreat from August 19-25 2018. 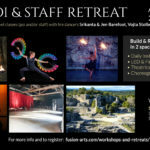 Here are the pre-requisites for Vojta’s Poi Workshops. If you still have some prep to do, you may contact Vojta for tips or refer to Nick Woolsey’s Beginners Series ! See Nick Woolsey’s Beginners Series for help!